Twitter has released an analysis of activity on the social network during the overtime shootout period in last week’s World Cup match between Brazil and Chile. 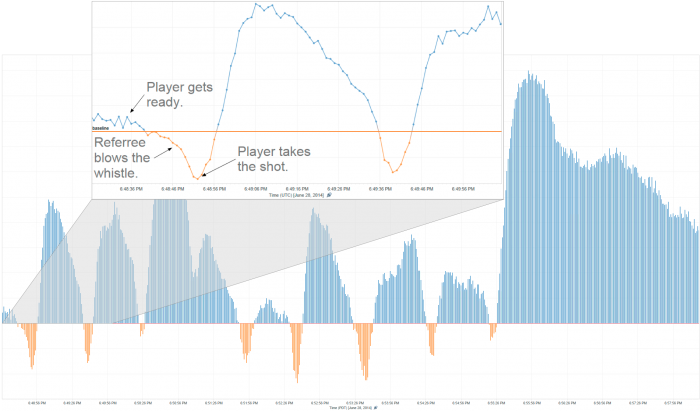 The pattern, which Twitter claims has repeated itself through every overtime shootout, is pretty interesting: people tweet like crazy leading up to the kick, watch intently (and with hands off keyboards) as the player gets ready and finally kicks, and then tweet like crazy again after the kick scores or misses. Seeing this phenomenon visualized is a small window into the relationships between our eyes, fingers, televisions and computer screens during big events. “Overtime shootout period”? What game were you watching?